It isn’t your standard tourist stop. But please do give it a chance. Cromwell, lying in the shadow of the surrounding giants Queenstown and Wanaka, takes you by surprise with its own unique character that goes far beyond its image of “commuters’ residential area”. It may not seem much at first glance, nor does it get even a tiny percentage of the attention of the rest of the region, but that’s exactly what preserves this town’s rough uniqueness. 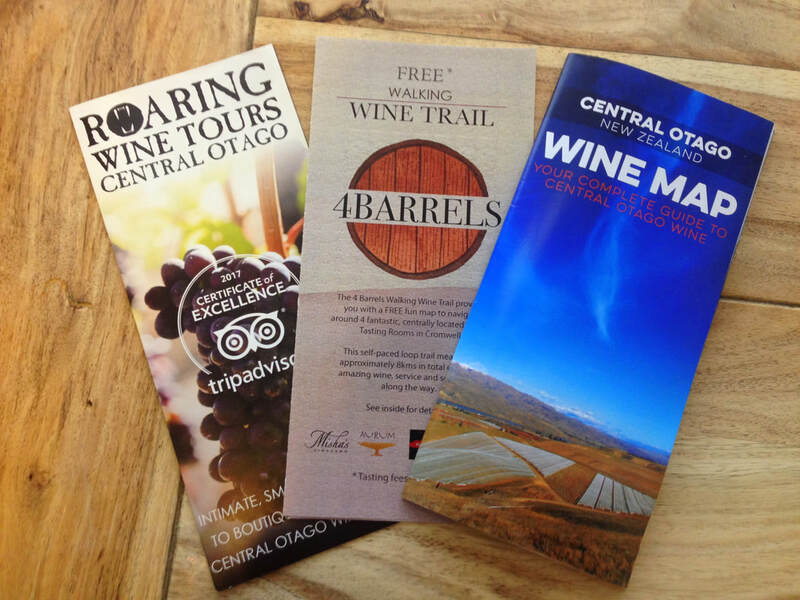 Tucked away quite centrally in the Otago region it offers a varied pallet of activities from outdoor adventures to discoveries of the most sublime Pinot Noirs of New Zealand. Coincidentally, these are two of my favourite things in life. Hiking and red wine. I knew that a two-week housesit-period would hardly be enough. Via a housesitters website I found a perfect gig looking after dog Mac, cats Bob and Thelma and a cheerful bunch of chubby chickens. And that stunning house... well, that was a welcome bonus! It took me not more than a day to check off the touristy sights, which can be summed up as the Fruit Statue (recently being renovated for almost a million NZ Dollars, yet looking more like a papier maché hobby-project gotten out of hand), the free-of-charge Cromwell Museum and the Heritage Precinct a.k.a. “Cromwell Old Town”. The latter is an unquestionable must-see, bringing you back to the settlement in its heydays, back then swiftly flourishing due to the booming gold mining industry. The original character is carefully preserved, yet giving it a modern use by utilizing the historical buildings as exhibition spaces for talented local artists. A broad time frame is required to check off all the interesting hikes in the direct area. The region offers anything from short day hikes to challenging multi-day tramps to suit the taste of any outdoor enthusiast. This one kicks off at the Bruce Jackson Memorial just passed the bridge, easily reachable by car or (in my case) mountain bike. 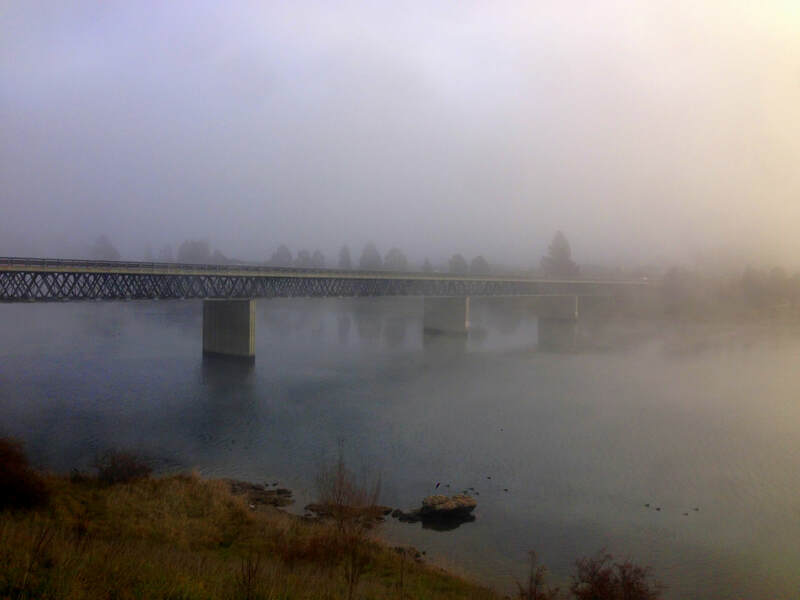 Cromwell is known for its low hanging mist that can cover the entire township in a cloak of thick invisibility, sometimes for the entire day. Even though this doesn’t sound like the ultimate hiking weather, it honestly couldn’t be better for this one. You see, when I went up there (unable to see my own two feet at the beginning of the trail) I discovered this mist is so low you can actually climb through it. After a short 10-minute climb you beat the clouds, the sun shining bright on your face and lighting up the cloud-filled valley. ‘Rewarding’ hardly covers this overwhelming sensation. The walk swirls through the lower mountain range of the old reservoir, taking only about an hour of your time. If you feel tempted to turn it into a demanding day hike, the trails continue over private land. Call the number on the signs for permission. As a wine aficionado Bannockburn, known for its stretched out vineyards and wineries, will undoubtedly be on your visit-list. While there, why not level out the alcohol blur with a refreshing walk in between? The Bannockburn Sluicings trail starts right in the middle of Felton Road, the winery street, and takes you for a short loop through a surreal landscape of old mining residues. Zigzagging through red oddly shaped hills eroded by nature and a dash of gold rush, history comes back to live. I decided to extend my Bannockburn Sluicings walk with a turn-off to the Long Gully Bluff Track reaching right up the mountains. This trail covers private land, which is why it’s only open on Sundays and Mondays and dogs aren’t allowed in. Stretch up, as you’re in for some serious steepness, but keep in mind the (mainly city-) views are worth your while. 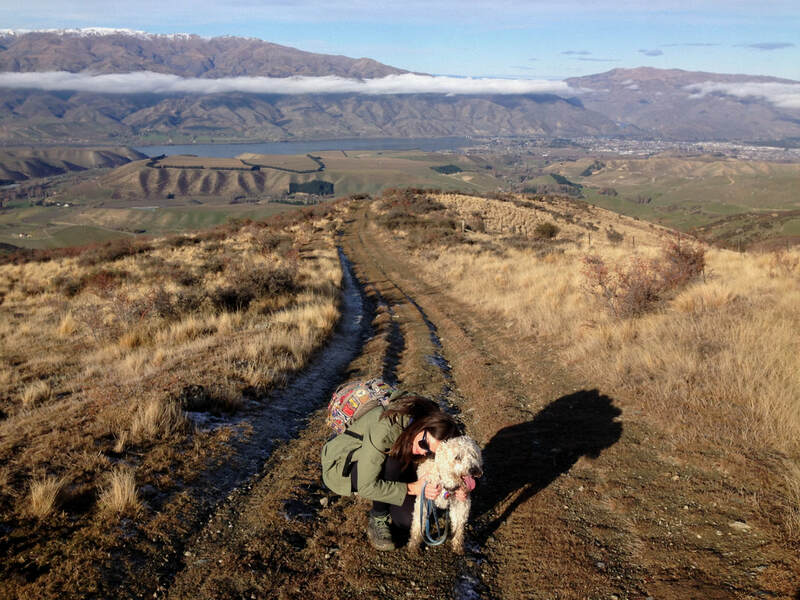 The most impressive mountain range in the Cromwell area is in my opinion the Pisa Conservation Area, containing several multi-day tracks with huts along the way as well as a handful of captivating day walks. You can make it as challenging as you like, but steepness is a consistent ingredient of any trail. I personally followed a private track starting from Swan Road (passed the 45th Parallel Walk), for which I had to ask permission from the friendly land owner. Together with my loyal tail-wagger Mac and a hiking buddy from earlier adventures, I conquered the magical views this unique piece of nature had in store for us. If you ask me about the most scenic hike I did, this one would be the immediate answer. It took me longer to reach this track by mountain bike than the actual walking time. What did I get back from that investment? A panoramic view over the herring-bone-shaped digging patterns* left by previous mining operations (*I quote the DOC: These virtually pristine remains are the result of ground sluicing; channelling water to the head of a claim and flooding the working face. Larger stones and rocks were removed and stacked, row after row in a herring bone pattern. The washed material was then directed or shovelled to a sluice channel to separate the gold from the gravel). Interesting, no doubt, but probably only worth it if you happen to pass by anyway. This river track reaches from the Gold Mining Centre (Touristy with a capital T) to the Bannockburn Bridge. I attempted it with a mountain bike, which might have cost me a few buckets of body sweat... its steepness mainly suits well-trained hikers’ legs. The dramatic Kawarau Gorge filled with a spinning stream of celeste water is one of the highlights of the area, yet often entirely overseen by the Queenstown-Cromwell traffic racing by right next to it. Even though the background sound of roaring vehicles never truly allows you to have that one-with-nature-awareness, this trail shows you the beauty of the gorge in its purest forms. A must when here. Okay, enough physical activity for now. Let’s shift the focus on the glass-to-mouth-movement you’ll get extensively trained in when visiting the area. Because man, Central Otago knows its wine. 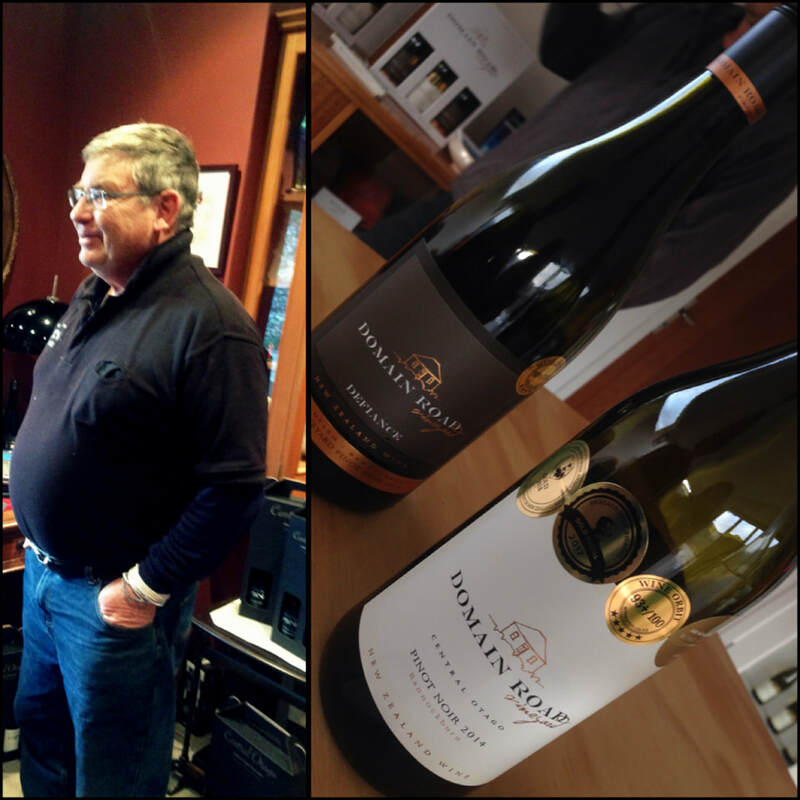 From Pinot Gris to Riesling to Chardonnay... but Pinot Noir, that’s what you’re here for. 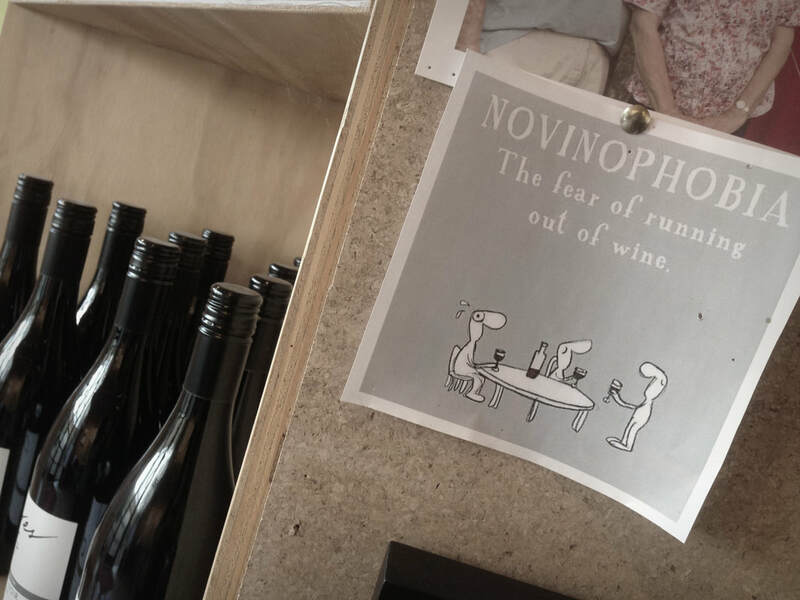 All natural forces come together to create the best Pinot Noir of the country, semi-jokingly referred to as ‘making wine on the edge of an abyss’. Its extreme continental climate marked by high elevation, plenty of sunshine hours, hot summers, cold winters and low humidity help to guarantee the purity and complexity of its grapes. The rich soil of silt, formed by glaciers during successive ice ages, interspersed by river gravel and water-eroded earth provide free draining and conservation of minerals. Combined with passionate craftsmanship and generous use of new oak, boutique wines celebrated for their full body, strong structure, richly extracted juices, hints of cherry and ripe fruits are created. Once started as a wild adventure, Misha Wilkinson and her husband arrived in this former epicentre of the gold rush to create gold once again: Pinot Noir in its purest form. After thorough investigation of the soils, intensive examination of the challenging macro- and meso-climatic conditions and the development of a precise expertise they are now producing a wide array of types and tastes, exporting all over Oceania and Asia. For $10 you can try five of their masterpieces (me being granted a sixth bonus), of which half of them Pinot Noirs... each with their own personality. 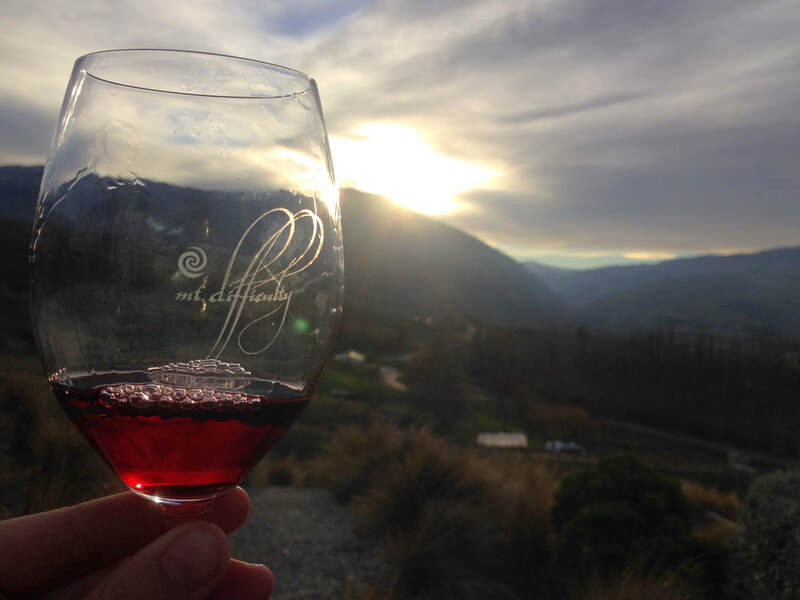 The Impromptu Pinot Noir 2015 has a subtle character, marked by aromas of raspberry and chocolate and a fruity yet spicy palate, ending with a textural finish. The Cantata Pinot Noir 2015 is characterized by a stronger, spicier smell and provides a more savoury experience. On the contrary, the medium-dark High Note Pinot Noir is rather prominent, sweeter but with a stronger component of acidity. On the contrary, the Starlet Sauvignon Blanc 2016 contains a more dry, grassy taste, opposed to the Marlborough versions. The Gallery Gewürztraminer 2015 and Limelight Riesling 2014 are sweeter treats (which aren’t for everyone), being best consumed on one of those bright sunny days. 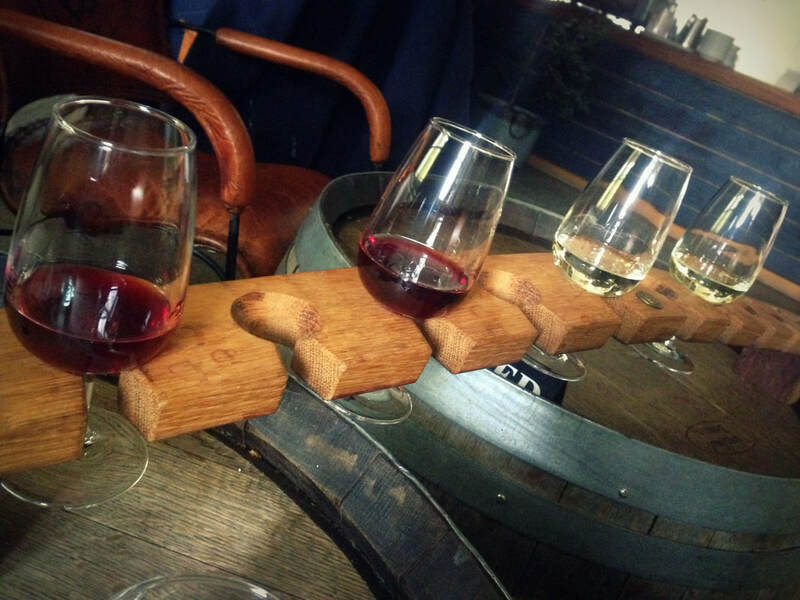 From the welcoming staff, the dogs, the atmosphere created with eye for detail and varying taste pallet... I enjoyed everything at Misha’s. What I liked most about this classy winery is that all of their wines are 100% organic. 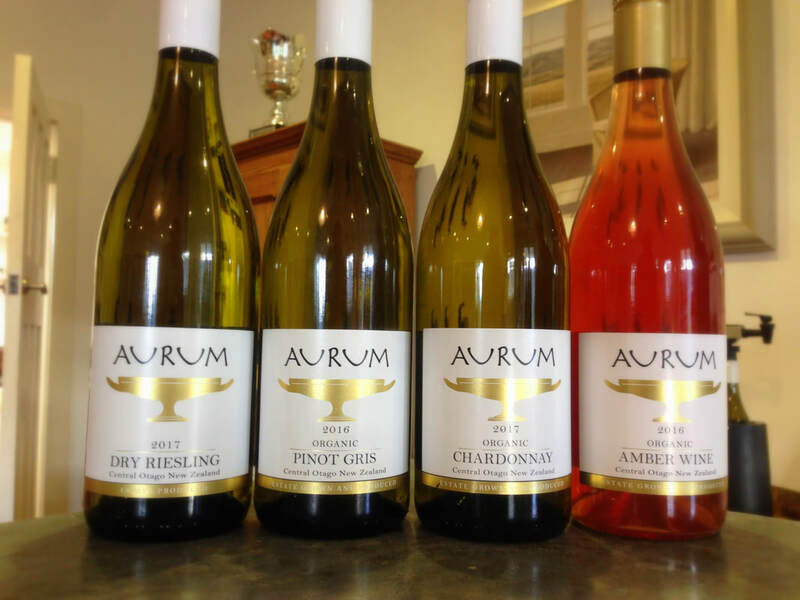 Since its starting point in 1997, Aurum has been thoroughly committed to an environmentally aware philosophy of wine-making, continuously seeking new ways to ensure eco-friendliness and sustainability. This family-owned business (partly French) embraces the traditional approach of using the wild yeasts naturally present and minimal intervention, providing an honest, pure glass. 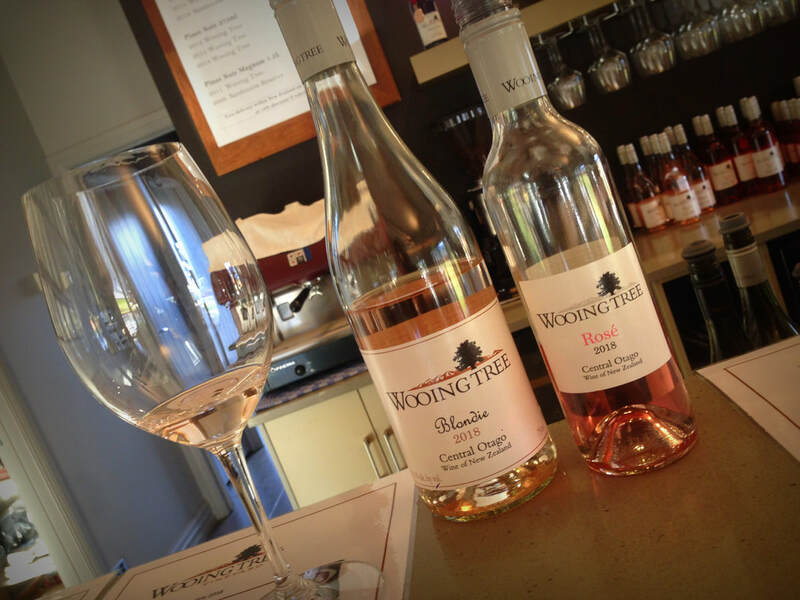 Their three varieties of elegant Pinot Noir, Amber Wine, Pinot Gris, dry Riesling, Rosé and refreshing Chardonnay are a feast for the taste buds. ​When entering Scott Base you know you’re in for a more laid-back vibe. Originally known as Mt. 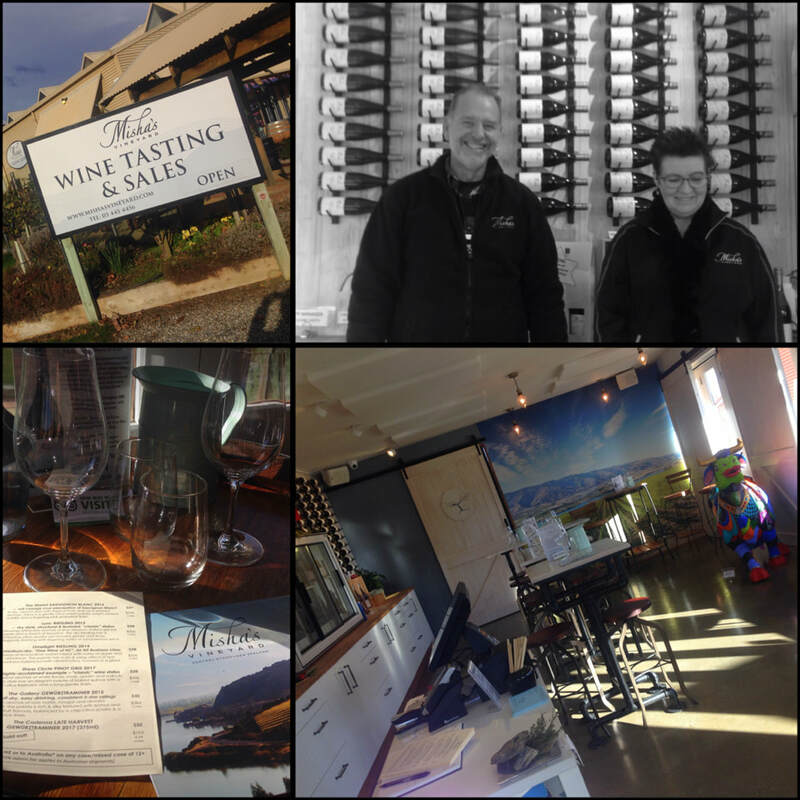 Michael, the vineyard is currently owned by Allan Scott Family Winemakers, embracing a more happy-go-lucky approach. 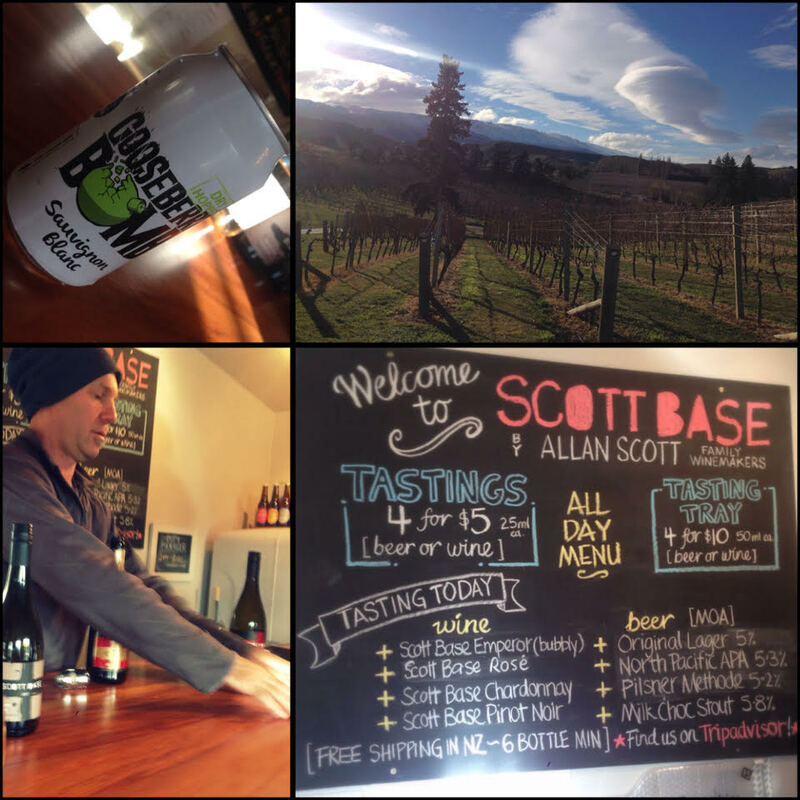 Besides a winery this is also a beer brewery, providing tastings of the best of both. For a small fee you can sample their bubbly Emperor, Rosé, Chardonnay and Pinot Noir.. plus a Cabernet Sauvignon in a can! 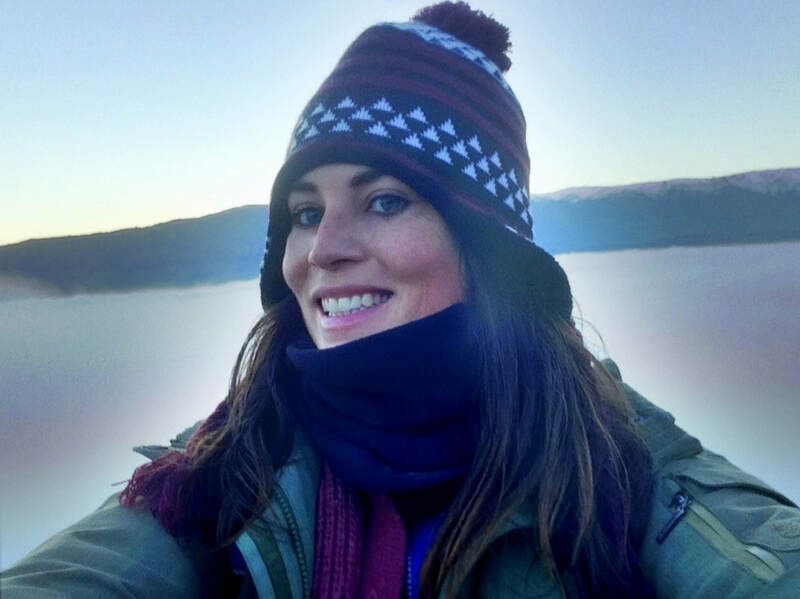 That’s a first, but undoubtedly handy to take along on all those hikes in the Otago region. Honestly... taste-wise this one isn’t on the top of my list, but I like their approach best of all: Don’t take life too seriously! At the place where locals once went to woo their lovers, now a small-scale family vineyard can be found. In the heart of Cromwell passion meets the barrel, wooing us with a fine selection of three variations of splendid Pinot Noir, a Pinot Gris, Chardonnay, some fruity Rosés, Riesling, and the unique Wooing Tree Blondie catering for all those unforgettable summer evenings. As this was the last winery of the day I took their somewhat smoky Pinot Noir Beetle Juice 2017 home in order to support their efforts in local beetle protection (no other personal interests involved, of course). King of the sparkle. 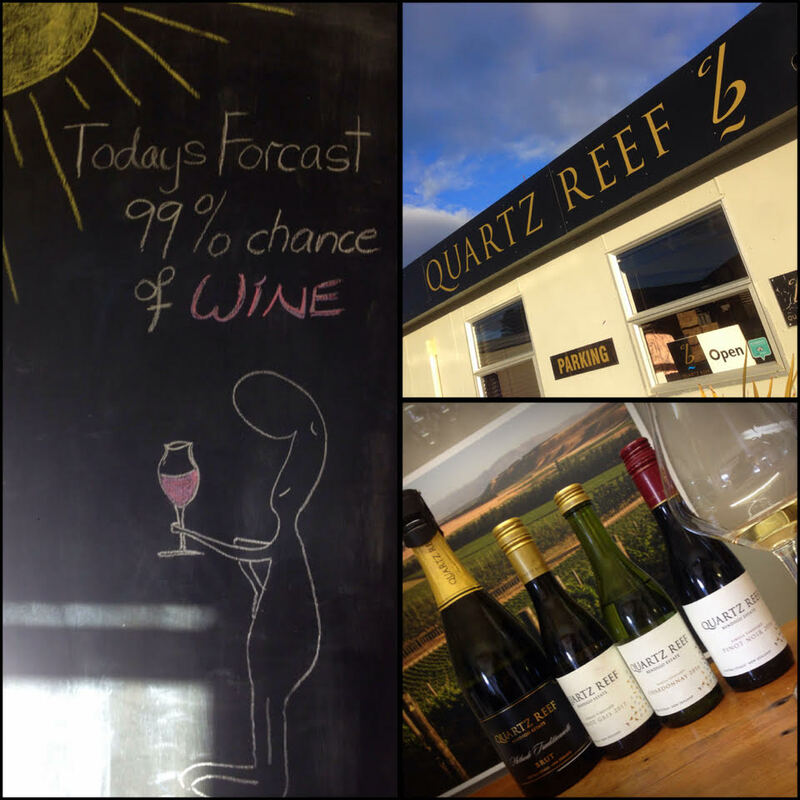 Whether sparkling wine is your thing or not (for me it isn’t), the appealing variety of the Bendigo-based Quartz Reef vineyards invites for a visit. Their prime selection is a Methode Tradionelle Brut / Vintage, tasting like New Year’s Eve, a Loop Rd. Noble Riesling reminding me of liquid candy, a dry Pinot Gris 2017, a quirky Rose and a Chardonnay like a Chardonnay should taste like... but in my case, it was the Pinot Noir (available in three versions – two for the rich, one for the poor man) that really grabbed my attention. Can’t go wrong with a Pinot in Central Otago! I would have liked to sip from their (for this region) unique Grüner Veltliner, but its limited availability made it too scarce for sampling. 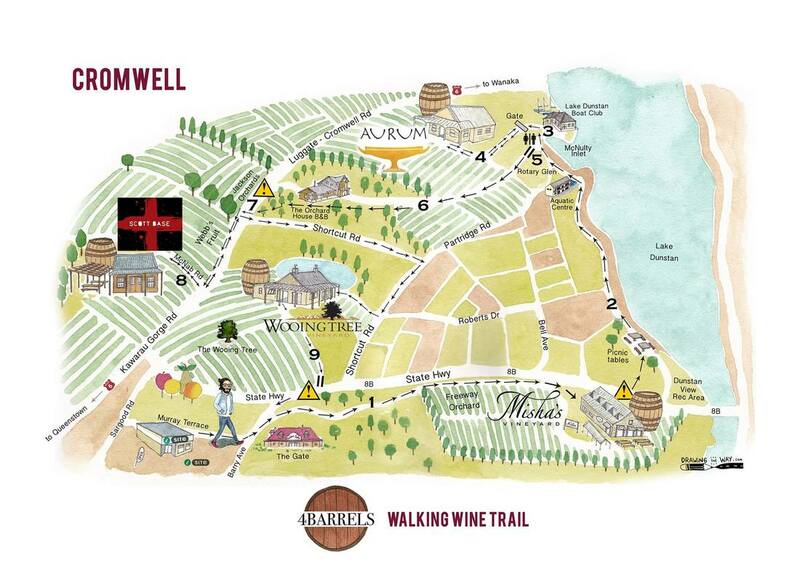 Finished your Cromwell-winery-checklist? Well, let me tell you there’s more. 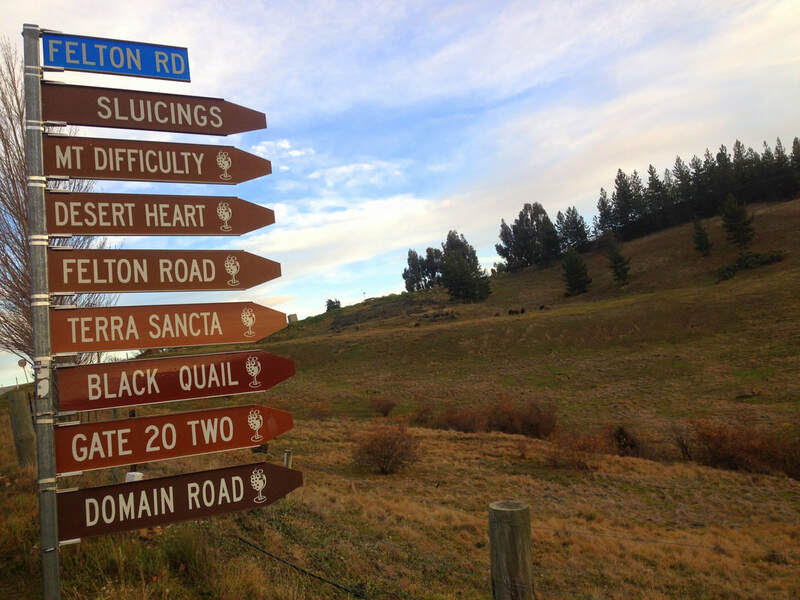 ​The first one on the famous Felton Road (the fast lane to intoxication) is the also-quite-famous Mount Difficulty, named after the notoriously complicated hike on the adjacent mountain. The fusion of previous wineries Molyneux, Mansons Farm, Verboeket Estate and Full Circle (the ‘Gang of Four’) resulted in a highly professional all-round-winery experience, including an on-site restaurant and efficient well-trained tasting staff guiding you rapidly through the sampling. For only $2 five wines of your choosing are all yours to drain... and if you’re willing to take my advice, make sure most of them are a selection of their spectacular Pinot Noirs! They do brew a decent Pinot Gris, Chardonnay, Sauvignon Blanc and a Riesling as well (and they’re currently experimenting with Chenin Blanc and Syrah’s, bring it on! ), but the whites are definitely secondary to the reds here. Visiting the Domain Road Vineyard feels more like visiting a friend. One with good taste in some splendid pinots, by all means. These friends, Graeme and Gillian Crosbie, do a darn good job producing award-winning cool-climate wines that are exported (on a limited scale) to almost every continent, being praised for their full structure, elegance and pure flavours. On the land that was once devoted to intense gold mining, now Chardonnays, Sauvignon Blancs, Rieslings, Pinot Gris, Pinot Noir Rosé’s, but predominantly Pinot Noirs are produced on a small-scale setting... and you can taste them for free! One of the pleasant surprises on Bannockburn’s Carnmuir Road is definitely Ceres, owned by one of the industry’s pioneering wine families – The Dicey’s (Matt Dicey is also Mt. Difficulty’s winemaker). You have to climb quite a serious hill to reach Heaven where the Goddess of Fruits resides, but boy, are those hand-crafted wines a well-deserved treat once you made it up there. Their passionate Swedish host guided me through all taste sensations of the afternoon: an invigorating Pinot Gris 2017; a Riesling 2017 from the most recent crops; an utterly delicious and deep Fifth Bridge Pinot Noir 2016, coming from one of their managed properties; their own price-winning Ceres Pinot Noir 2015 (a reason to be proud! ); and a sweet Fifth Bridge Riesling. It’s worth mentioning that Gewurztraminer grapes were recently planted: a (hand-)harvest we all look forward to! * This rather commercial winery sells Brut, Rose Brut, Pinot Gris, Pinot Rose, Riesling, Chardonnay and Sauvignon Blanc as well. What do you see? Two Pinot Noirs from different years, one deliciously smooth with a very earthly after taste, the other strong and overwhelmingly acid, reminding me of the French style I never really learned to appreciate. The whites contain a Pinot Gris from the Gibbston area, seizing simultaneously a sweet and sour sensation... somehow reminding me of the taste of hangover casting a deep shadow over the after-party mornings marking my turbulent student years. Also their Riesling wouldn’t be my first choice of serving when trying to please my loved ones. I was unable to even finish the tasting glass. Generous tasting glasses, it has to be said: Your first choice if you prefer quantity over quality. 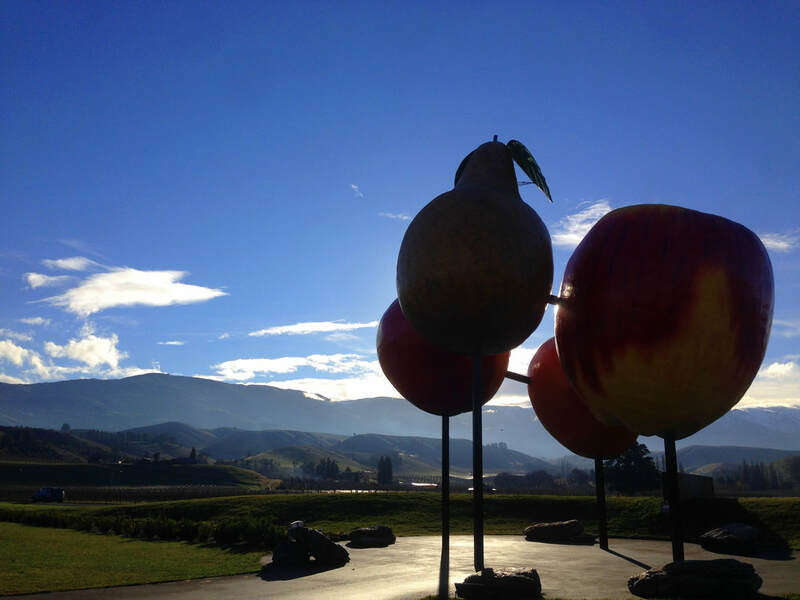 ... longing for another taste of flavourful Otago. The unsuspected surprise of the south. 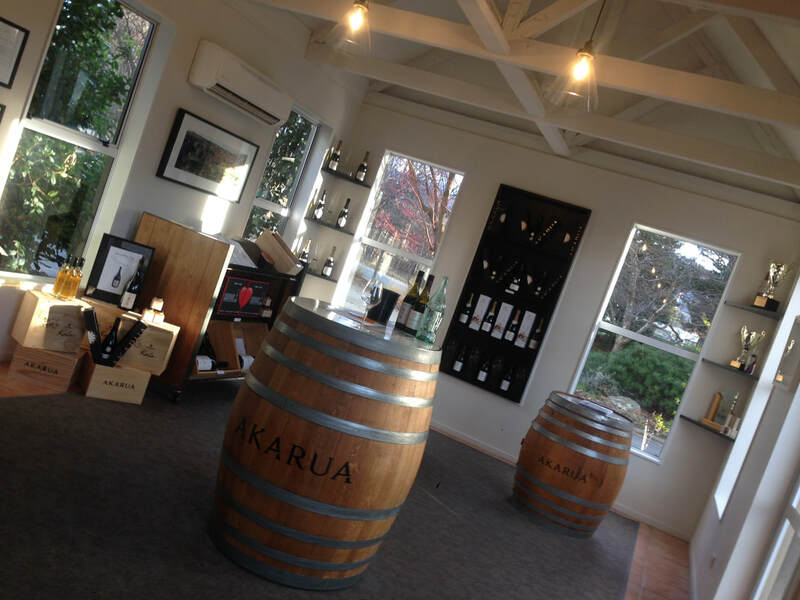 - Try more NZ wine on Waiheke Island! 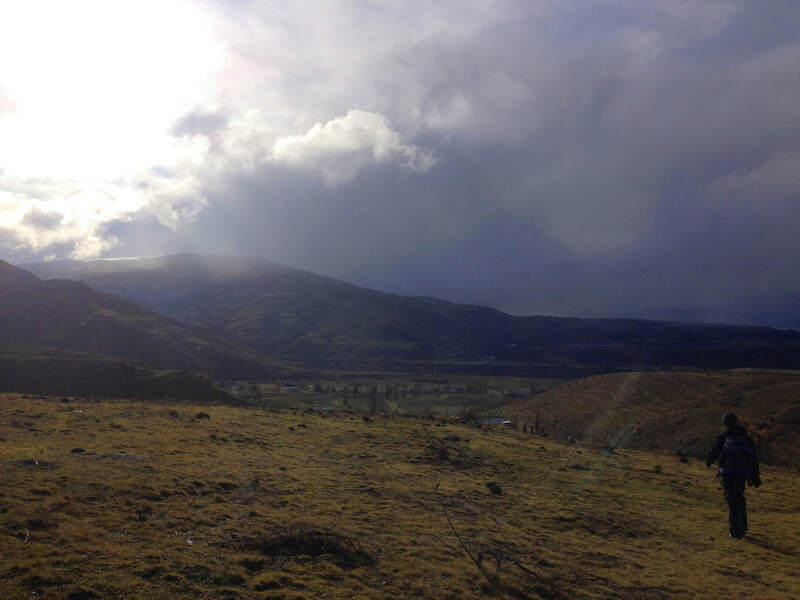 ​- More housesitting in New Zealand: A good experience... and a bad one!